Hankering for Indian food? Don’t go out to eat. Prepare this quick and nutritious vegetable curry instead. 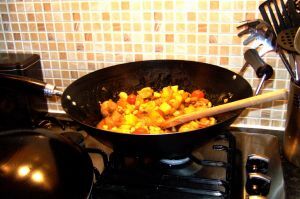 Start by frying the onions, then add the potatoes and rest of the vegetables, frying for a few minutes before adding each successive ingredient. After all the vegetables have been added, pour in the boiling water and add the bullion cube and the curry paste. Cover and cook until all veggies are tender, stirring occasionally, and it tastes nice, about 30 minutes. I serve it with apricot couscous, which is simply couscous to which you have added finely chopped dried apricots! And I know that mixing regions when I serve this with couscous, but i was out of rice the first time I made it, so couscous is what I stick with. This dish is also delicious with baked chicken, or you could cook some chicken thighs at the bottom of a slow cooker, adding the curry on top. Then it would be a marvelous prepare ahead meal, as the couscous really only takes about five minutes to make. Patak’s makes a fantastic line of Indian sauces, snacks, breads and more. If you’ve never tried them, you really should.